The current food crisis in Niger – sparked by the worse drought since 1984 – is reducing children and animals to mere sacks of bones. In desperation, some villagers in this country of subsistence farming have turned to “survival foods” – grass and leaves. Six of her children join her in her search for the Aguwa plant, as do other neighbors Amina Chaibou, 27, and Alicha Abdou, 47 from the village. There are about 70 families in currently using this “survival food” daily during the hard times in Gazourawa. Her husband has gone to Matameye, 120km away in neighboring Zinder region, to find work. He works as a porter delivering people’s shopping home on foot. He has no car or cart. It takes about an hour to pick the leaves and return to the village. Alicha, her children and neighbors wash the crop thoroughly, the boil it, changing the water four times. UNICEF, the world’s leading children’s organization, has supplied all the clinics in this vast country with sufficient therapeutic foods, anti-malaria, anti-biotic, and anti-anemia medicines and vitamin supplements to treat a caseload of an estimated 378,000 severely malnourished children. Together with the World Food Program they devised a plan to provide protein rich and fortified food to about 500,000 children under two years old in the surrounding regions considered “at risk” as a precautionary measure to nip malnutrition in the bud. National figures show that since mid-May more than 1,000 children are being admitted to therapeutic feeding centers for malnutrition daily. At the Madarounfa CRENI in the Maradi Region – one of the largest in the country – Dr Moussa Laouali, Deputy Chief of Medicine of the district says that there has been a 70% increase between January and May this year compared to the same period last year. There has also been a 41% rise in deaths of children under 5. Prolonged periods of an unbalanced diet leads to malnutrition, which initially is moderate. But continued deprivation of proper food and it leads to severe malnutrition. Left unchecked medical complications set in. The medical complications differ from region to region. In Maradrounfa, children were suffering from malaria, diarrhea or respiratory infection. This treatment is not available at this centre. Ibrahim has been stabilised. His severe malnutrition is being treated and he will be discharged in a week’s time and sent to a CRENAS (a pediatric out-patient clinic for severe, acute malnourished children without medical complications). “We are farmers and our crops have failed. There is little to eat and Ibrahim is sick again. My neighbor’s child was also sick and he got better after coming to this hospital, so I decided to bring him here too hoping they can make him better,” she says. It was not until February 2010 that the government finally admitted there was a problem. It was a new military junta, which overthrew the government of President Mamadou Tandja. The junta, which is called the Supreme Council for the Restoration of Democracy worked with, the United Nations to issue an emergency appeal for help in April. In Dakoro, the CRENI sees another type of medical complication – edema. Children are swollen as a result of retention of interstitial fluids, symptoms pointing to more serious medical issues involving the heart, liver and kidneys. Hamza Mahamadou, seven months old, was admitted 12 days ago. He had breathing difficulty and diarrhea but those are symptoms of bigger problems. At his age, he ought to be 7-8kgs but he’s 4.4kgs. He is severely malnourished and will die without treatment. Four beds away is Ai Soiley, also severely malnourished. His grandmother accompanies him. His mother just gave birth and is at home. Ai looks like a six-month old child but he is two years old. He has a bad rash around his waist, which looks as though he had been scalded. The doctor says it’s not a burn. 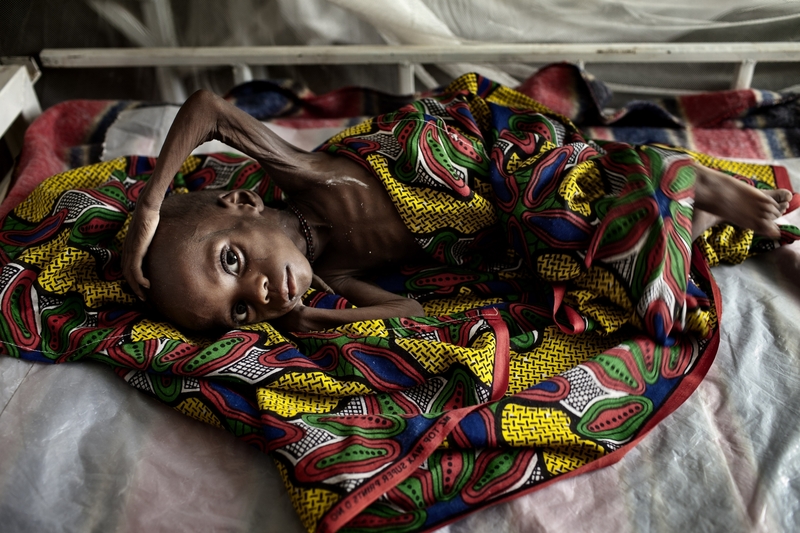 It is complication from severe malnutrition. His grandmother brought him here not for malnutrition but because he had diarrhea for the last month. The intensive care unit of this field hospital is also filled with newborn babies up to one month-old, some weighed only 1.25kg. These are premature babies. They are full term. The doctor says they are malnourished because the mothers are also malnourished – though they don’t look it – and cannot produce breast milk. Both are kept and treated here. They are also taught about breastfeeding, and proper hygiene and sanitation. About 50km north of Dakoro is the village of Gadabedji, which is the site of a huge animal reservation. It is regarded as the last grazing outpost for animals. When pastures around the country are depleted, animals are brought here but there is little grazing land left here. Ibrahim Tonga was born here, as was his father and his father. He rears animals – cows, sheep and goats. The occupation is passed down through the generations. It is the life of his people – the Touaregue. He can’t bear to see the physical condition of his nine children, he says. They are withering away before his eyes. He’s doing everything that he can for them but it is not enough. Ten minutes away there are animal traders slaughtering dying animals, cooking and bagging their meat to export to neighboring Nigeria less than 100km away. They leave behind graveyards of bones. With the 2010 survey, aid agencies regrouped and discussed the problems. With 2.5 million children now at risk and some agencies short on cash, UNICEF, which leads the nutritional emergency response among international agencies operating in the country, has adopted a multi-prong approach. UNICEF says that their multi-prong approach at the national level is to increase staff and medical supplies at every CRENAS for severe and acute malnourished children. This has already been done. They have provided additional tents and beds. All CRENAS are adequately stocked with therapeutic foods and medicine. They have hired eight nurses, which are in training. CRENAS are opening seven days a week as opposed to just one day last year. In addition, UNICEF has agreed to pay the salaries of staff at seven CRENAS, which were being closed because the international NGO, which funded them, had run out of money. The World Food Program (WFP) usually provides food for moderately malnourished children but funding shortfalls are affecting their operation. UNICEF’s Director Guido Cornale says an agreement has been reached with their sister agency for UNICEF to assist in providing emergency food for the 1.2 million moderately malnourished children. WFP and UNICEF also teamed up to provide blanket feed to 500,000 children less than two years old who live in vulnerable areas. This food was being provided for four months – May to August. They’ve agreed to extend this to December 31 and expand coverage to 900,000 children. Finally, UNICEF is also examining the merits of a cash-transfer program to replace the blanket-feeding program. In this program paid for by UNICEF and WFP, local NGOs distribute a corn Soya blend of sugar and meal together with oil. This means dealing with purchases, importation, transportation, management, and distribution. To donate to UNICEF and save children’s lives, visit www.unicef.org.uk/niger . Inoussa Ahalima, 23-months-old at a pediatric hospital for severely malnourished children with medical complication. Inoussa is severely malnourished and also suffering from complications as a result of malnourishment, respiratory infection and diarrhea. He weighs just 5.1kgs. Doctors at the Madarounfa CRENI (pediatric hospital for severely malnourished children with medical complications), one of the largest in Niger, are trying to increase his weight to at least 7.9kgs before discharging him. He will be referred to a CRENAS (outpatient pediatric post for severely malnourished children) for follow-up. Up to May this CRENI has had a 70% increase in the number of children being admitted here compared to last year and an increase in deaths by 41%. Seven million people are going hungry each day because of a severe food crisis gripping the country. Of this number 1.6 million children are severely or moderately malnourished and another 1 million at risk of malnutrition. Inoussa Ahalima, 23-months-old at a pediatric hospital for severely malnourished children with medical complications. Inoussa is severely malnourished and also suffering from complications as a result of malnourishment, respiratory infection and diarrhea. He weighs just 5.1kgs. Doctors at the Madarounfa CRENI (pediatric hospital for severely malnourished children with medical complications), one of the largest in Niger, are trying to increase his weight to at least 7.9kgs before discharging him. He will be referred to a CRENAS (outpatient pediatric post for severely malnourished children) for follow-up. Up until May this CRENI has had a 70% increase in the number of children being admitted here compared to last year and an increase in deaths by 41%. Seven million people are going hungry each day because of a severe food crisis gripping the country. Of this number 1.6 million children are severely or moderately malnourished and another 1 million at risk of malnutrition. 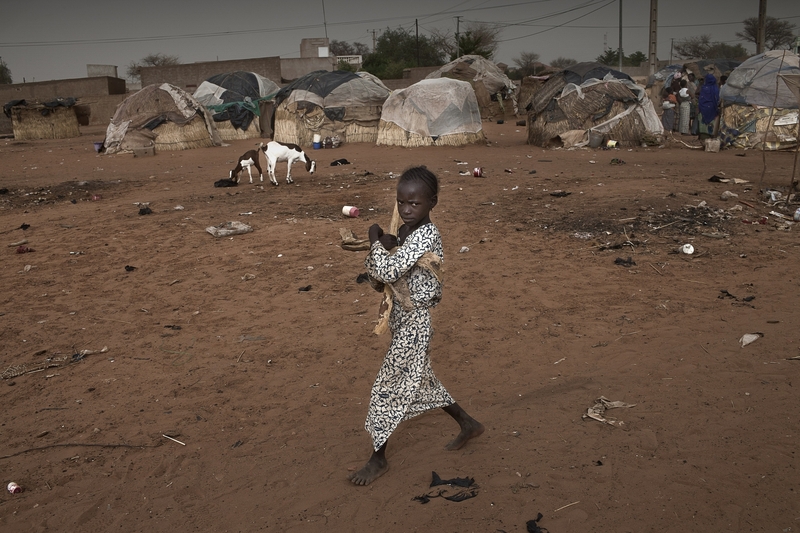 A Nigerien child collecting wood in a temporary Internally Displaced Camp. Hungry women and children come from more than 350 km away to the capital Niamey in search of work. They set up temporary shelters anywhere there is available land. This upper-middle class neighborhood called Cite Sting with homes costing in excess of 50 million CFA is home to one of hundreds of such groups across the capital. The mini-camps have no water, sanitation or electricity. Some women work as cleaners earning 10,000 CFA a month which is far short of what is required to feed them and their children but they have to make the money stretch to also provide for their families back in their villages. The basic minimum wage in the country is 25,000 CFA. A Nigerien woman holding her child as she attends a cash transfer program. A faster method of feeding people in Niger who are affected by the severe food crisis – the worst since 2005 – is a Cash Transfer program. Two international NGOs are trying out this program. UNICEF says that it is faster because they do not have to organize shipping, trucking, storage, distribution and other logistics for food supplies. On the trial program families that have at least one child under 5, at least one acre of land and no animals receive 20,000 CFA (£27.71) per month to buy food. At the current cost of living, this is adequate to help a family with seven children. There are other conditions and training on what nutritional foods to buy. Each month there are checks carried out to determine whether the rate of malnutrition is falling among the beneficiary families. 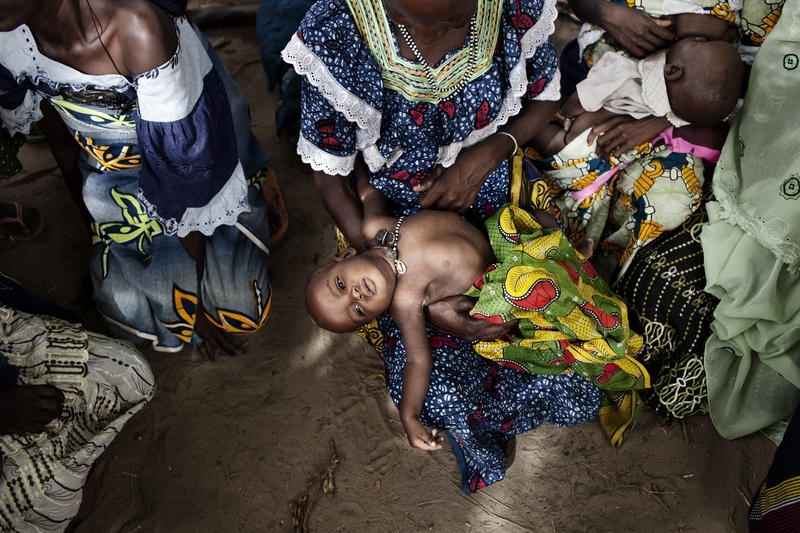 This is one of a multi-prong emergency approaches to deal with malnutrition among children in the West African nation. There are about 1.6 million children who are severely or moderately malnourished. Another 1 million are at risk of malnutrition. Nigerien meat traders cook the meat of dead animals in order to sell it throughout Nigeria, after buying the animals from local villagers. 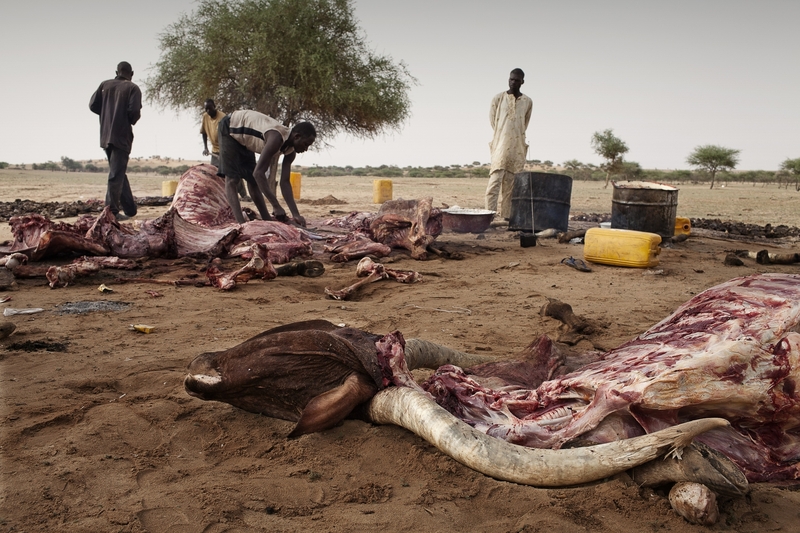 The stench from dead animals is very bad in Dakoro, about 450 km Northeast of the Nigerian capital, Niamey. This vast reserve in Gadabedji is the last grazing outpost for animals across the large West African State. In the last two weeks of June, 4,000 animals died as a result of a severe food crisis gripping this nation of 15 million people and affecting nearly half of the population. Meat traders roam the area buying dying animals for a fraction of the going rate. The meat is cooked on the spot and shipped throughout Nigeria. One man had to sell his animals (normally worth 400,000 CFA) for 70,000 CFA. His children are severely malnourished due to a lack of food. They are among 1.6 million children who are severely or moderately malnourished. Another 1 million are at risk of malnutrition. A Nigerien girl attending a cash transfer program. A faster method of feeding people in Niger who are affected by the severe food crisis – the worst since 2005 – is a Cash Transfer program. Two international NGOs are trying out this program. UNICEF says that it is faster because they do not have to organize shipping, trucking, storage, distribution and other logistics for food supplies. On the trial program families that have at least one child under 5, at least one acre of land and no animals receive 20,000 CFA (£27.71) per month to buy food. At the current cost of living, this is adequate to help a family with seven children. There are other conditions and training on what nutritional foods to buy. Each month there are checks carried out to determine whether the rate of malnutrition is falling among the beneficiary families. This is one of a multi-prong emergency approaches to deal with malnutrition among children in the West African nation. There are about 1.6 million children who are severely or moderately malnourished. Another 1 million are at risk of malnutrition. Nigerien Archirou Edi Cahibou, 10-months-old being held by his mother at a pediatric clinic for severely malnourished children. Archirou was rushed to a CRENAS (pediatric clinic for severely malnourished children) in the Maradi region, 650km east of the capital. A routine monthly medical check in his village of Bouzei found signs of his nutritional deficit. Due to the severe food crisis this year CRENAS are operating seven days a week – as compared to only one day per week last year. More than 1.5 million children are being treated this year for severe malnutrition and the death rates have also increased. An early detection program is being piloted in 800 villages across the region to teach people how to check their children every month for signs of malnutrition. During the planting season, families work in the fields and only take their children to a CRENAS when they are very sick and severely malnourished. This program is a win-win situation for all, especially for Archirou who is expected to make a full recovery. Nigerien girls working during a session on essential family practice preventing malnutrition delivered by villagers trained by UNICEF at a community level. 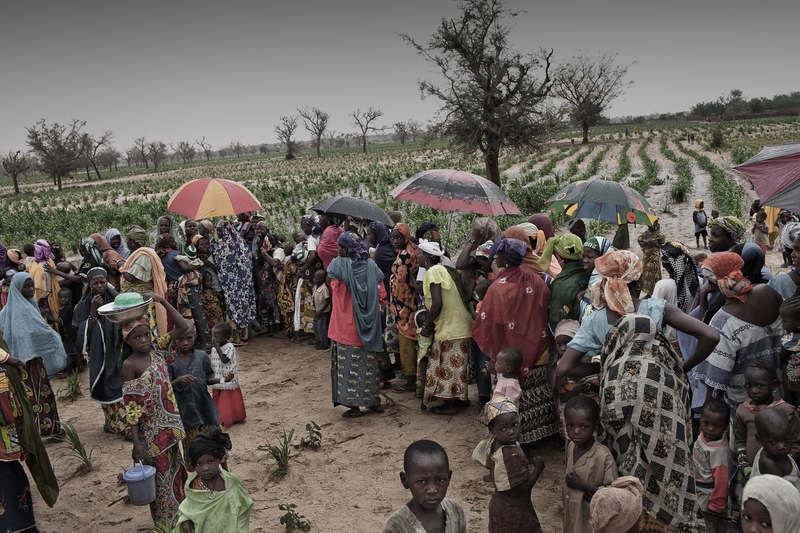 A serious food crisis is gripping the West African nation of Niger as a result of poor rains. 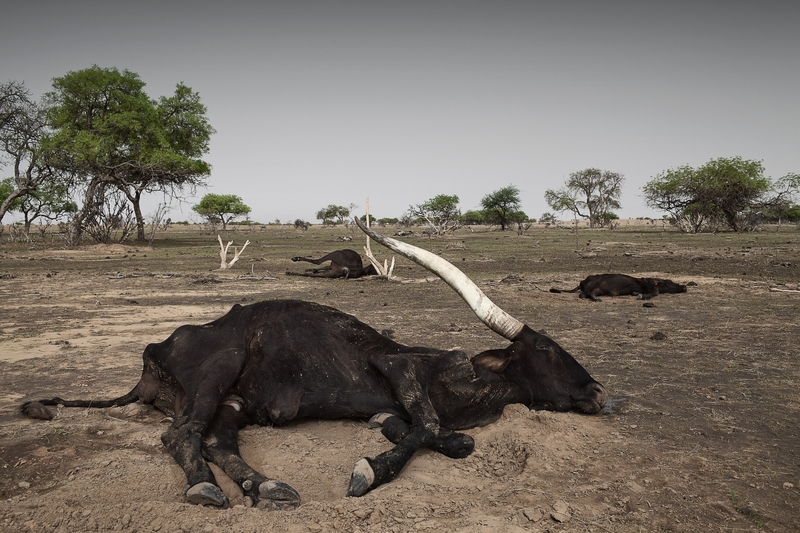 Crops have failed, watercourses have dried up, and thousands of animals are dying. Seven million people are going hungry each day of which 1.6 million children are severely or moderately malnourished and another 1 million at risk of malnutrition. 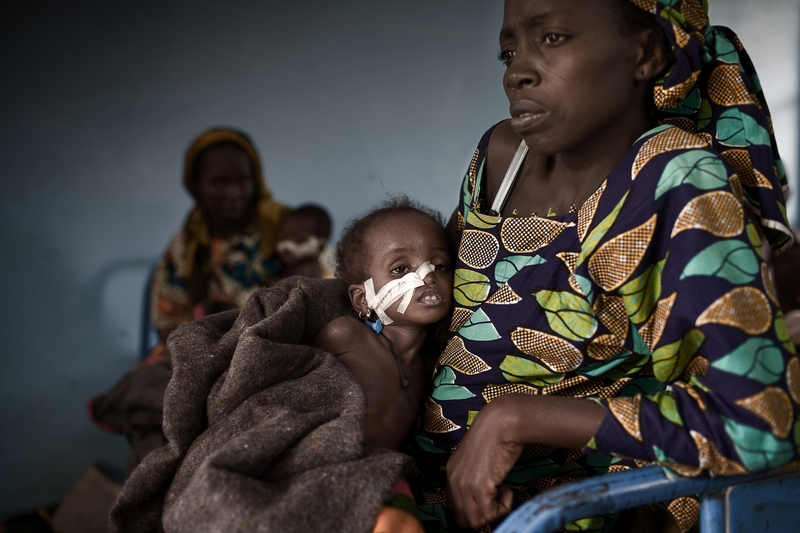 Ibrahim Awal, 10-months old is held by his mother Miriam Awal, 25-years-old at a pediatric hospital for severely malnourished children with medical complications. The prognosis for Ibrahim is that he will die as a result of complications of malnourishment. For Mariam, 25, it will be the second child she has lost. Ibrahim has fluid on his brain, which can be corrected with surgery and managed with medication, but Mariam and her husband are too poor to afford it and she ís resigned to the fate that will befall her. She ís brought him to this CRENI (pediatric hospital for severely malnourished children with medical complications), which is one of the largest in Niger. They do not do the type of surgery required. Up to May there has been a 70% increase in the number of children being admitted here compared to last year and an increase in deaths by 41%. These children are so severely malnourished that medical complications develop. Seven million people are going hungry each day because of a severe food crisis gripping the country. Of this number 1.6 million children are severely or moderately malnourished and another 1 million at risk of malnutrition. 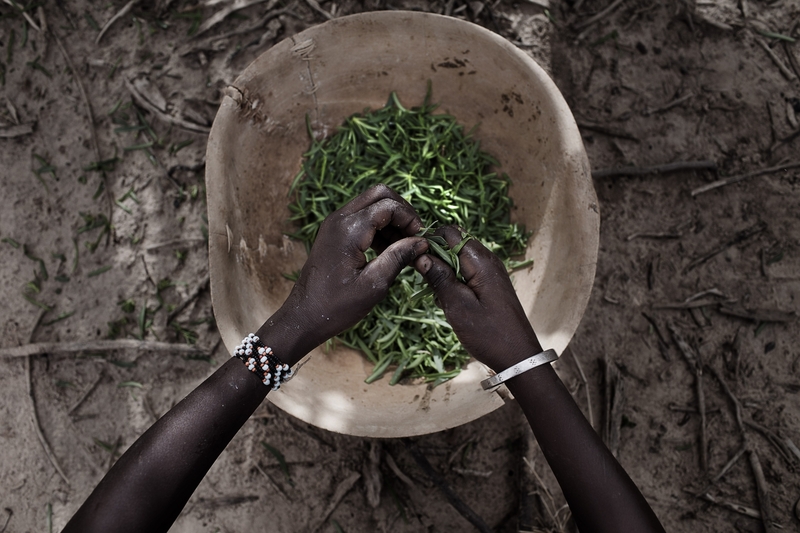 Relatives of Amina Chaibou pick leaves from the Aguwa tree. The village of Gazoura in Zinder, 1000 km east of the capital Niamey, is so hard hit by the food crisis affecting the country that the people have resorted to eating leaves. Aicha Manzo, her neighbor, Amina Chaibou and their children pick leaves each morning from the Aguwa tree. The leaves are bitter and contain toxins. The milk from the stem causes blindness upon eye contact. All the animals stay clear of this tree however 70 families in this village have no choice. They boil it four times to reduce the bitterness and toxins and eat it either on its own or with millet if any is available. 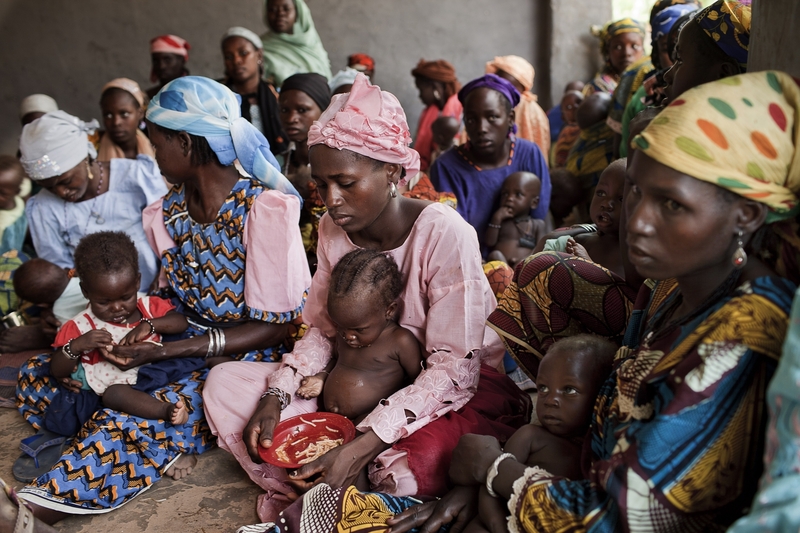 Nigerien women with their malnourished children at a pediatric outpatient clinic for severely malnourished children. Hundreds of women have turned up at this CRENAS at Matamey in Zinder, 1000km east of the capital Niamey. Their children are not well. A CRENAS is a pediatric outpatient clinic for severely malnourished children. 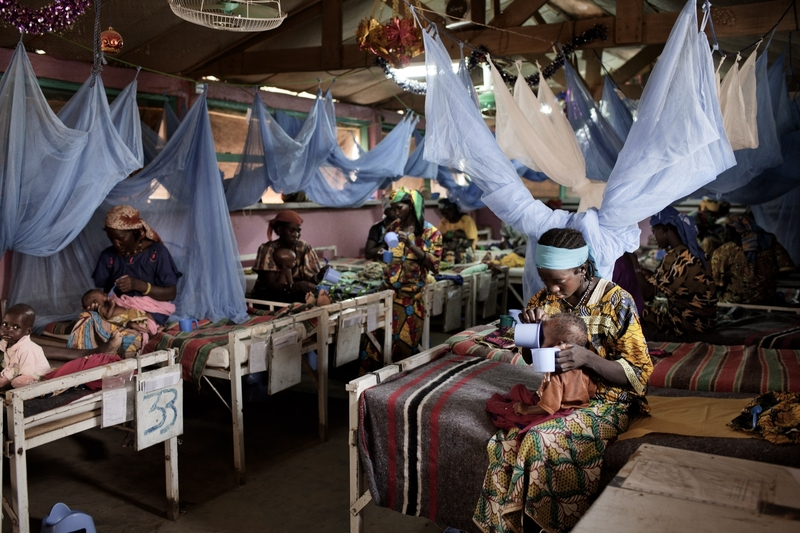 Last year, the CRENAS in this West African nation operated one-day a week. Since the severe food crisis that is affecting the country, the CRENAS has been working seven days a week and there is a constant flow of children, almost all with complications such as diarrhea, malaria, respiratory infection, or anemia. The majority of children are about half their normal weight. Some are too weak to stand. 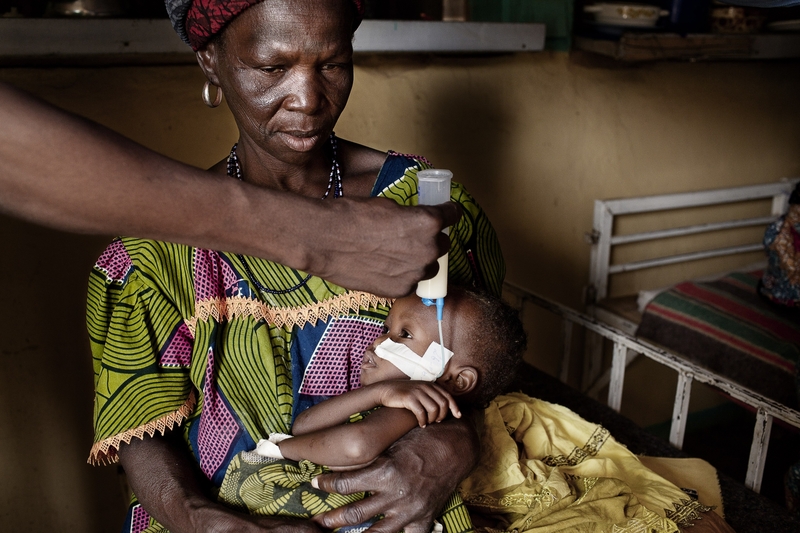 A Nigerien woman receives medical care for her malnourished child in a pediatric hospital for severely malnourished children with medical complications. The severe food crisis, affecting this poor West African nation of Niger has progressively worsened with the country seeing a substantial increase in the number of malnourished children. One of the largest Crèmes reported a 41% increase in children dying from malnutrition. There are about 1.6 million children who are severely or moderately malnourished. Another 1 million are at risk of malnutrition. 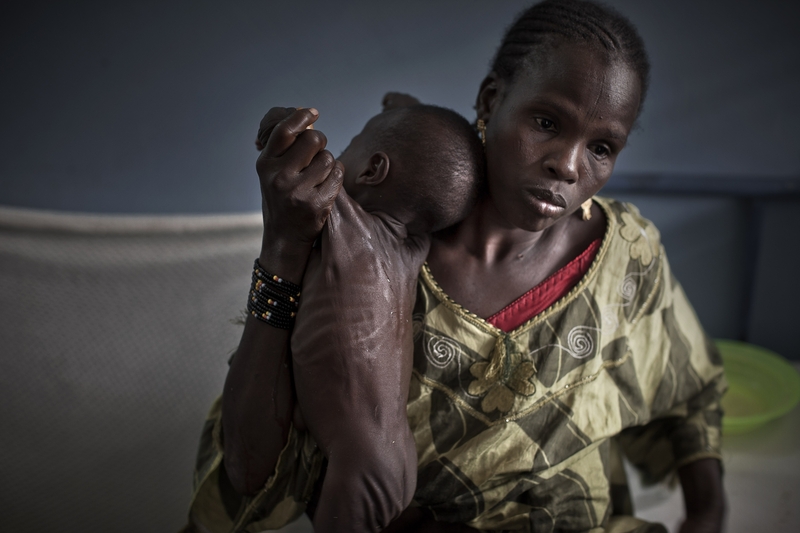 Saguirou Sani, 17-months-old being held by her mother at a pediatric clinic for severely malnourished children. Saguirou has had diarrhea and no appetite for the last three days. At the CRENIs (a pediatric clinic for severely malnourished children), the doctor says these are all symptoms of severe malnutrition. He weights 6.3kg but at this age he should be about 15kg. He will be given a diet of Plumpy’Nut for the next four weeks and expected to make a fully recovery. Seven million people are going hungry each day because of a severe food crisis gripping the country. 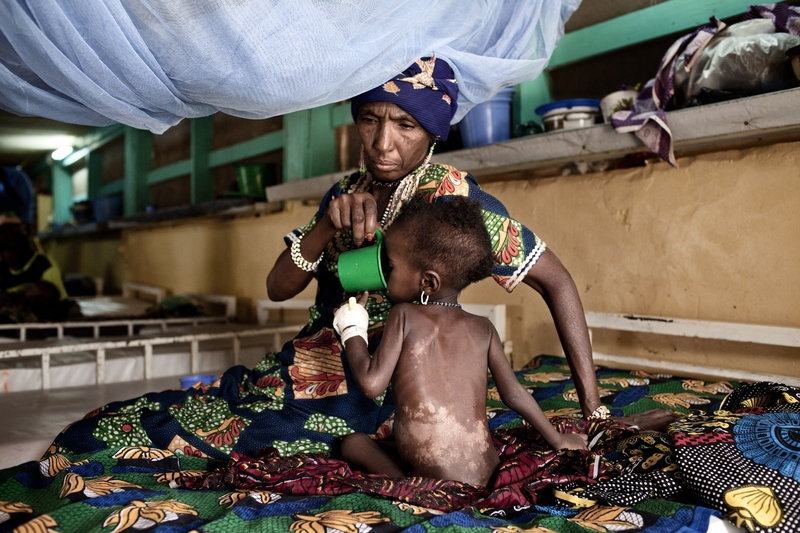 A Nigerien malnourished child is seen in a pediatric hospital for severely malnourished children with medical complications. A severe food crisis, affecting this poor West African nation of Niger has progressively worsened with the country seeing a substantial increase in the number of malnourished children. One of the largest CRENIs reported a 41% increase in children dying from malnutrition. There are about 1.6 million children who are severely or moderately malnourished. Another 1 million are at risk of malnutrition. A Nigerien woman holds a malnourished child at a pediatric hospital for severely malnourished children with medical complications. In Madarounfa, on the border with Nigeria, is one of the largest CRENIs (pediatric hospital for severely malnourished children with medical complications). Up to May there has been a 70% increase in the number of children being admitted compared to last year and an increase in deaths by 41%. These children are so severely malnourished that medical complications develop. Nigerien woman and their children attending a session on essential family practice preventing malnutrition delivered by villagers trained by UNICEF at a community level. 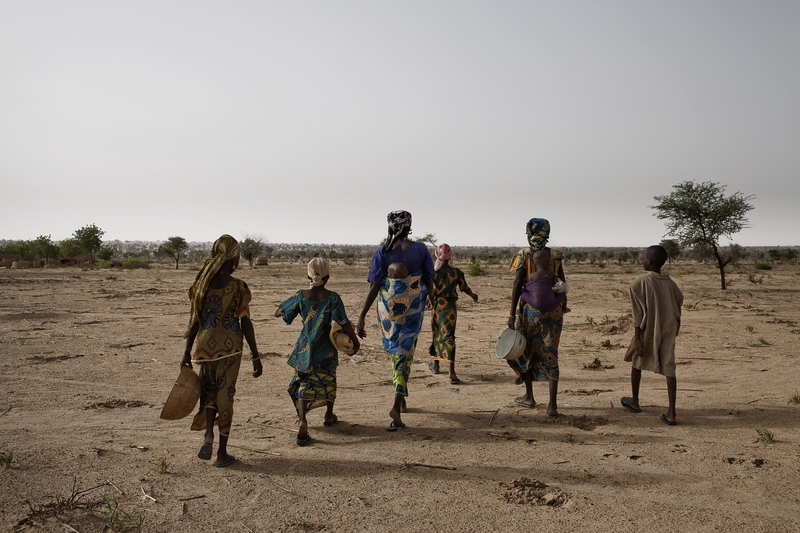 A serious food crisis is gripping the West African nation of Niger as a result of poor rains. Crops have failed, watercourses have dried up, and thousands of animals are dying. Seven million people are going hungry each day of which 1.6 million children are severely or moderately malnourished and another 1 million at risk of malnutrition. A Nigerien woman taking care of her malnourished child in a pediatric hospital for severely malnourished children with medical complications. The severe food crisis, affecting this poor West African nation of Niger has progressively worsened with the country seeing a substantial increase in the number of malnourished children. 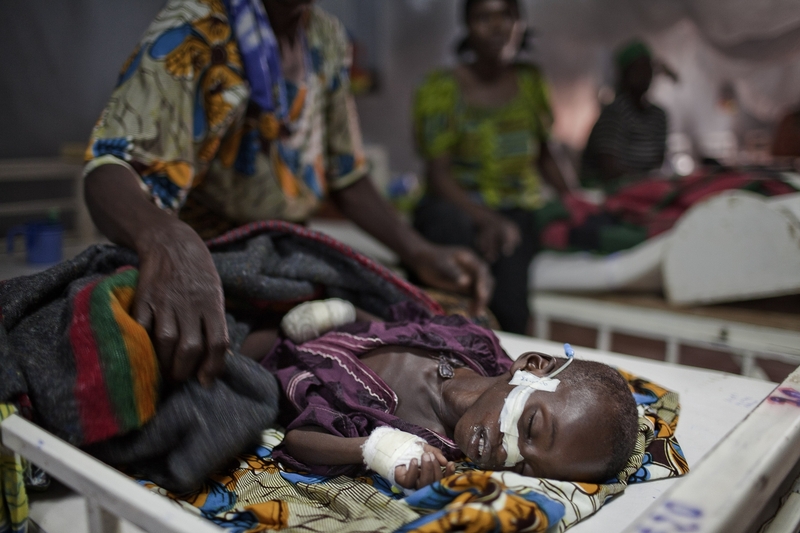 One of the largest CRENIs reported a 41% increase in children dying from malnutrition. There are about 1.6 million children who are severely or moderately malnourished. Another 1 million are at risk of malnutrition. 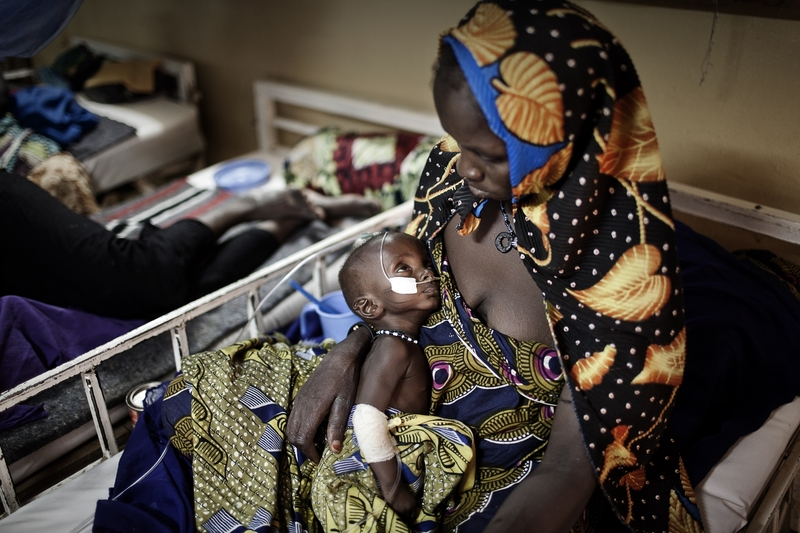 A Nigerien woman receives medical care for her malnourished child in a pediatric hospital for severely malnourished children with medical complications. The severe food crisis, affecting this poor West African nation of Niger has progressively worsened with the country seeing a substantial increase in the number of malnourished children. 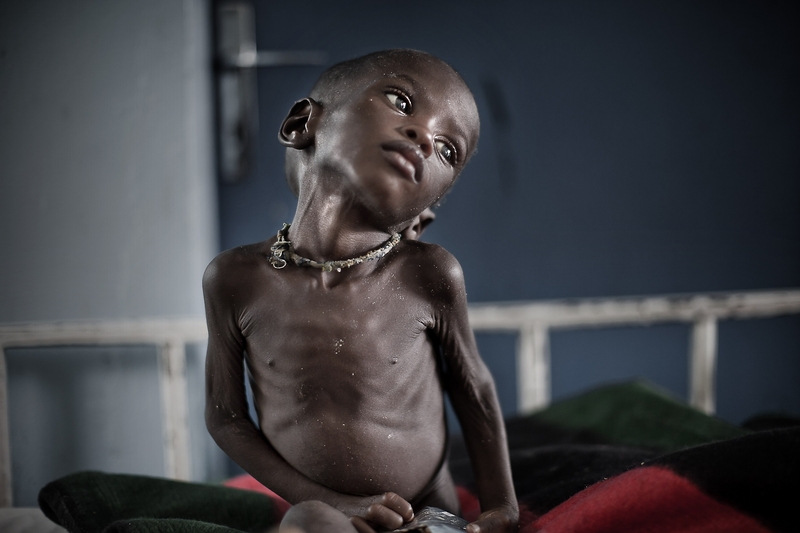 One of the largest CRENIs reported a 41% increase in children dying from malnutrition. There are about 1.6 million children who are severely or moderately malnourished. Another 1 million are at risk of malnutrition. 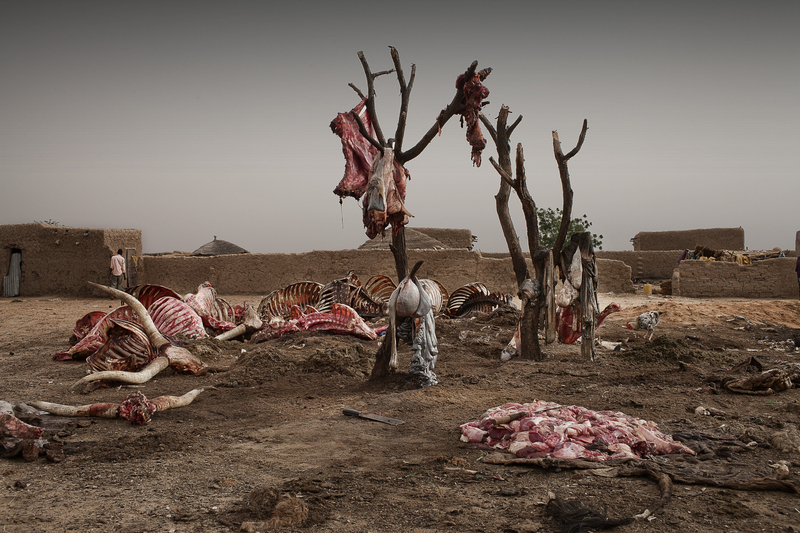 Dead animals, on the road to Gadabedji, in Dakoro, about 450km north-east of the Nigerien capital, Niamey, are signs of just how bad the food crisis is that has this poor West African nation. Dead animals are everywhere. They’ve collapsed due to lack of water and food. This is the area that animals come to as a last resort when pastures are gone in other parts of the country. In the last two weeks of June 4,000 animals died on the reserve. Meat traders roam the area buying dying animals for a fraction of the going rate. The meat is cooked on the spot and shipped to Nigeria. One man had to sell his animals (normally worth 400,000 CFA) for 70,000 CFA. His children are severely malnourished due to a lack of food. They are among 1.6 million children who are severely or moderately malnourished. Another 1 million are at risk of malnutrition. Amina Soiley, taking care of her malnourished grandson in a pediatric hospital for severely malnourished children with medical complications. Amina has brought here grandson Ai, 24 months, to the Dakoro CRENI (pediatric hospital for severely malnourished children with medical complications) because she noticed he had diarrhea for a last month, which turned out to be a symptom of a bigger problem, which is severe acute malnutrition, and could kill him. He weighs 6.7 kgs, half of what he should because he’s been wasting away from lack of food. The severe food crisis, affecting this poor West African nation of Niger has progressively worsened with the country seeing a substantial increase in the number of malnourished children. Entrails of dead animals hanging as meat traders buy the dead animals to cook them on the spot and send them sell them in Nigeria. The stench from dead animals is very bad in Dakoro, about 450 km Northeast of the Nigerian capital, Niamey. This vast reserve in Gadabedji is the last grazing outpost for animals across the large West African State. In the last two weeks of June, 4,000 animals died as a result of a severe food crisis gripping this nation of 15 million people and affecting nearly half of the population. Meat traders roam the area buying dying animals for a fraction of the going rate. The meat is cooked on the spot and shipped to Nigeria. One man had to sell his animals (normally worth 400,000 CFA) for 70,000 CFA. His children are severely malnourished due to a lack of food. They are among 1.6 million children who are severely or moderately malnourished. Another 1 million are at risk of malnutrition. 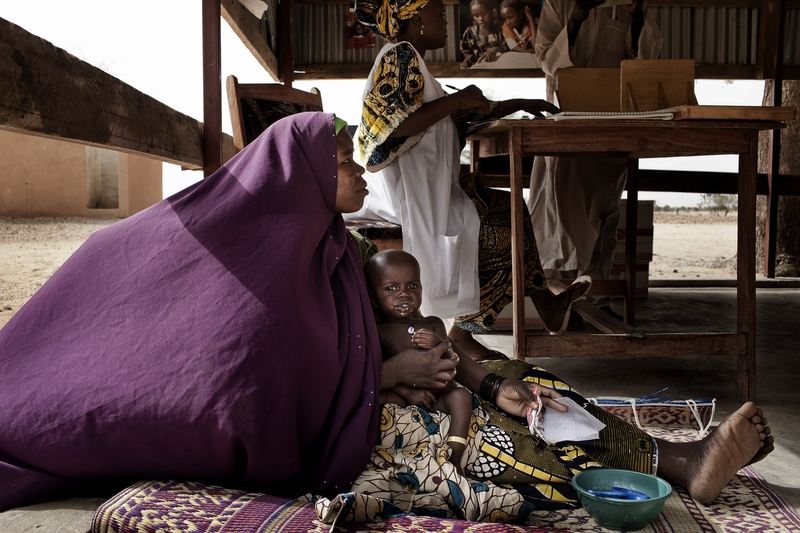 Nigerien women with their malnourished children at a pediatric outpatient clinic for severely malnourished children. Hundreds of women have turned out to this CRENAS at Matamey in Zinder, 1000km east of the capital, Niamey. Their children are not well. A CRENAS is a pediatric outpatient clinic for severely malnourished children. 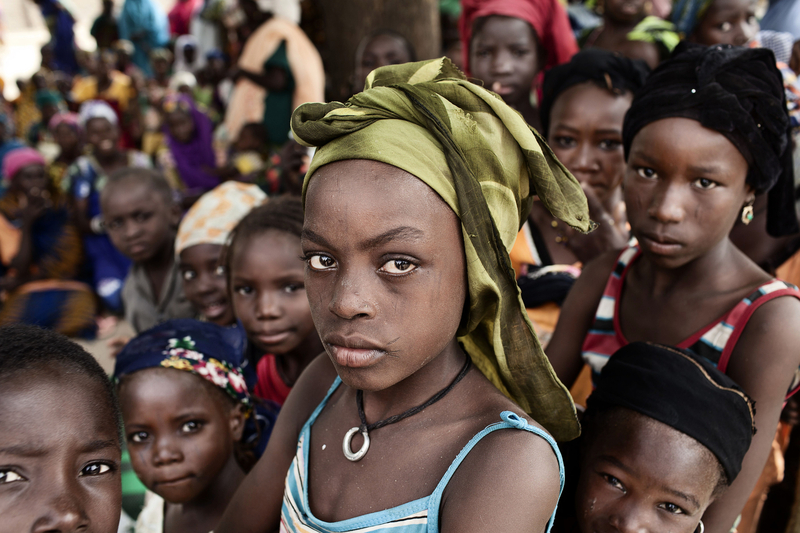 Last year, the CRENAS in this West African nation operated one-day a week. Since the severe food crisis that is affecting the country, the CRENAS has been working seven days a week and there is a constant flow of children, almost all with complications such as diarrhea, malaria, respiratory infection, or anemia. The majority of children are about half their weight. Some are too weak to stand. 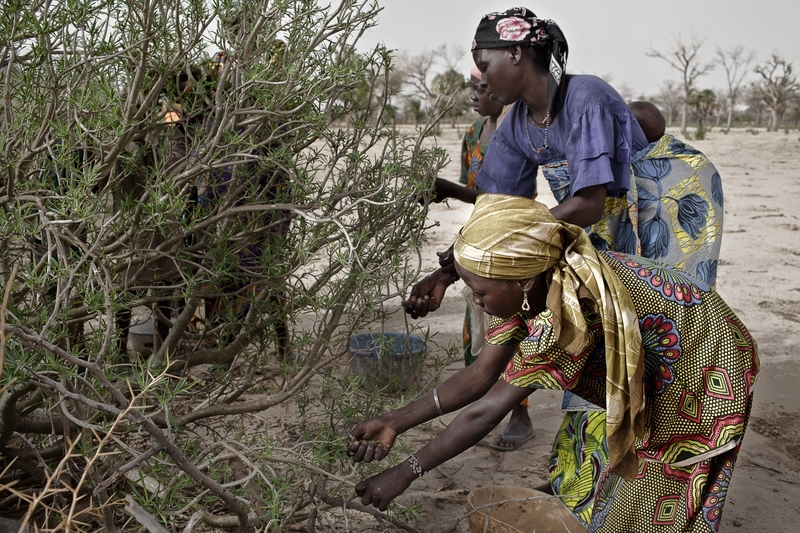 Relatives of Amina Chaibou pick leaves from the Aguwa tree. The village of Gazoura in Zinder, 1000 km east of the capital, Niamey, is so hard hit by the food crisis affecting the country that people have resorted to eating leaves. Aicha Manzo, her neighbor Amina Chaibou and their children pick leaves each morning from the Aguwa tree. The leaves are bitter and contain toxins. The milk from the stem causes blindness upon eye contact. All the animals stay clear of this tree but 70 families in this village have no choice but to eat the leaves. They boil it four times to reduce the bitterness and toxins and eat it either on its own or with millet if any is available. There are about 1.6 million children who are severely or moderately malnourished. Another 1 million are at risk of malnutrition. Amina Chaibou and her relatives leave the village to go picking leaves from the Aguwa tree. The village of Gazoura in Zinder, 1000 km east of the capital, Niamey, is so hard hit by the food crisis affecting the country that people have resorted to eating leaves. 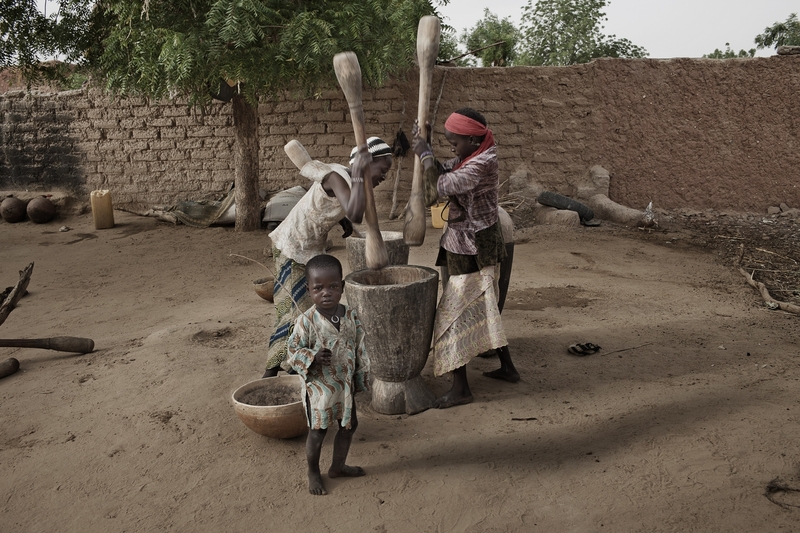 Aicha Manzo, her neighbor Amina Chaibou and their children pick leaves each morning from the Aguwa tree. The leaves are bitter and contain toxins. The milk from the stem causes blindness upon eye contact. All the animals stay clear of this tree but 70 families in this village have no choice but to eat the leaves. They boil it four times to reduce the bitterness and toxins and eat it either on its own or with millet if any is available. There are about 1.6 million children who are severely or moderately malnourished. Another 1 million are at risk of malnutrition. 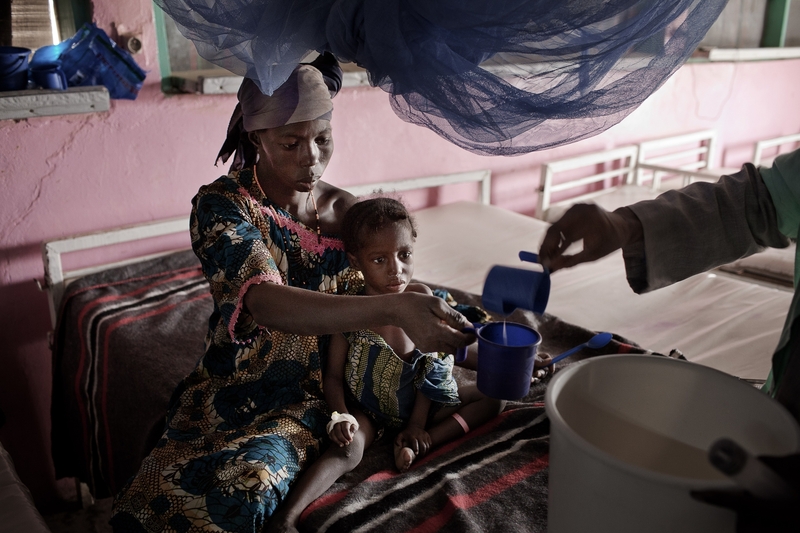 Mousbafou Abdou, 15-months-old is held by her mother at a pediatric outpatient clinic for severely malnourished children. Mousbafou is severely malnourished and has other medical complications that prompted his mother Mariama, 33, to bring him to this CRENAS (pediatric out-patient health centre for severely malnourished children) in Matameye, Zinder. At 5.3kgs he is also under-weight for his age. He will be referred to the next level of health care, the CRENI, which is a pediatric hospital for severely malnourished children with medical complications. As a result of the severe food crisis affecting this West African nation – the worst since 2005 – CRENAS are operating daily compared to once per week last year. Staff has been increased, more medical supplies have been moved in anticipation of a flood of sick children this year. 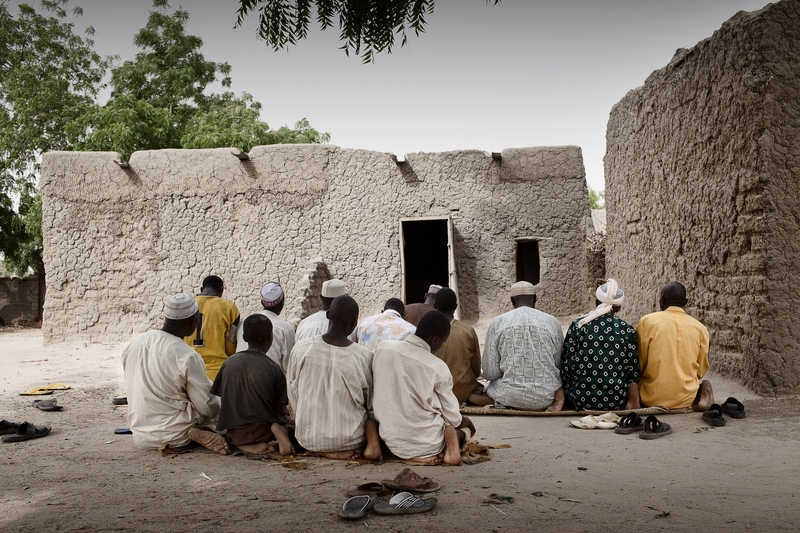 One of the largest CRENI on the Niger/Nigerian border has reported a 70% increase in admissions and a 41% increase in the death rate. Mousbafou is among 2.5 million children affected by the current emergency. 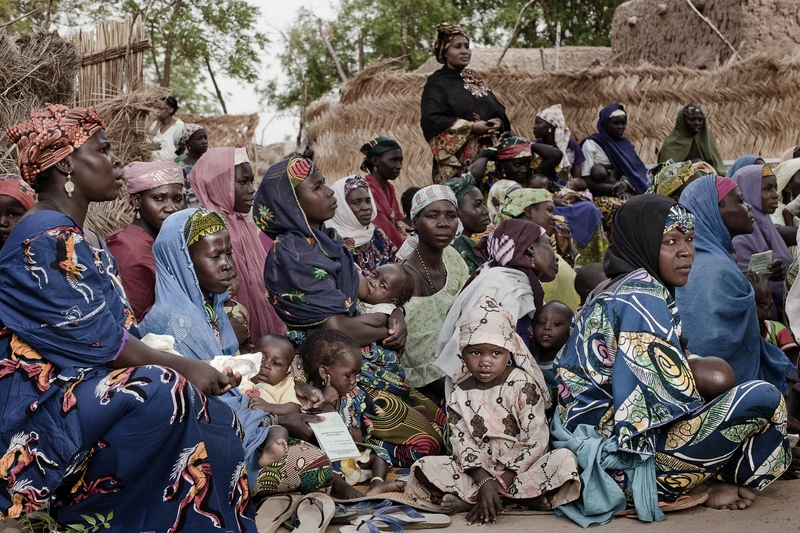 About 400,000 are in need of treatment for severe malnutrition, 1.2 million are moderately malnourished and 900,000 living in vulnerable areas require emergency food aid to stave off malnutrition. Nigerian men prey as their women attend a cash transfer program. A faster method of feeding people in Niger who are affected by the severe food crisis – the worst since 2005 – is a Cash Transfer program. Two international NGOs are trying out this program. UNICEF says that it is faster because they do not have to organize shipping, trucking, storage, distribution and other logistics for food supplies. On the trial program families that have at least one child under 5, at least one acre of land and no animals receive 20,000 CFA (£27.71) per month to buy food. At the current cost of living, this is adequate to help a family with seven children. There are other conditions and training on what nutritional foods to buy. Each month there are checks carried out to determine whether the rate of malnutrition is falling among the beneficiary families. 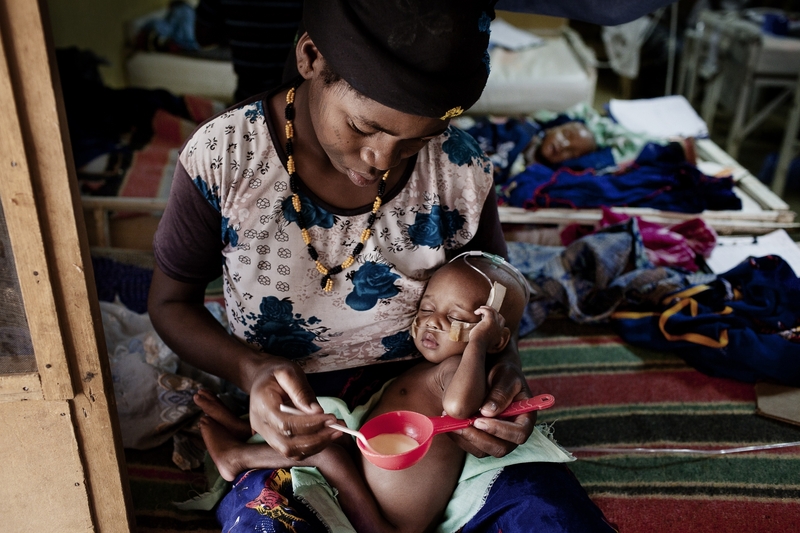 This is one of a multi-prong emergency approaches to deal with malnutrition among children in the West African nation. 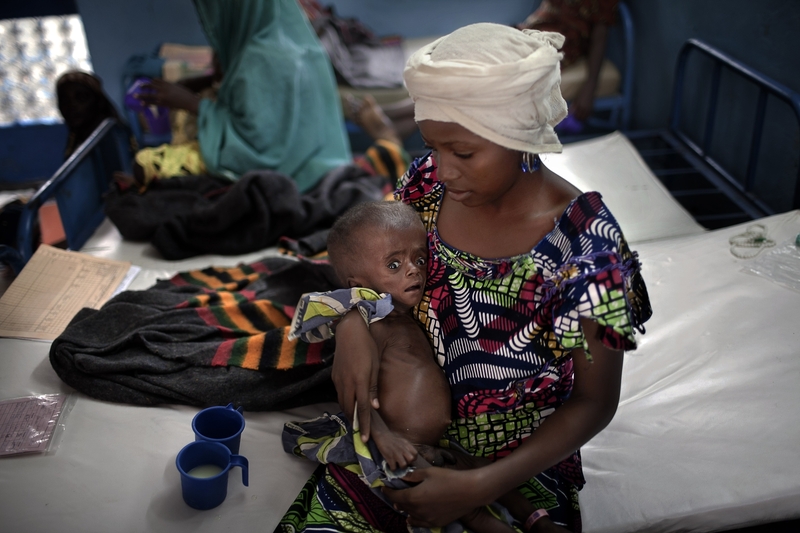 Maimouna Mahamadou, 34-years-old, holding her son Hamza, 7-months-old in a pediatric hospital for severely malnourished children with medical complications. Maimouna was forced to take Hamza in when she started having diarrhea. The doctors at the Dakoro CRENI (pediatric hospital for severely malnourished children with medical complications) also found her to be severely malnourished. She weighs 4.4kg but should be at least 7kg. She will recover but it may be just a matter of time before she is admitted again. This is a pastoral family whose animals have been dying of whom, have run out of money to buy food. 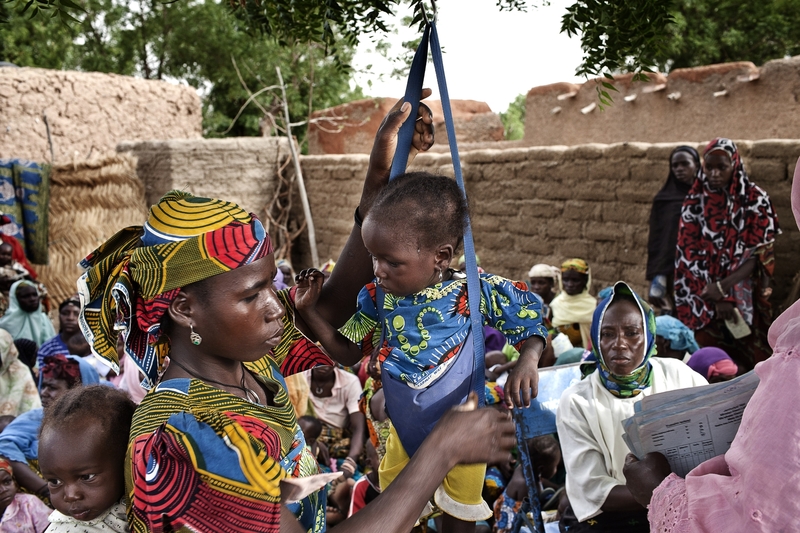 A Nigerien child is weighed during a session on essential family practice preventing malnutrition, delivered by villagers trained by UNICEF at a community level. 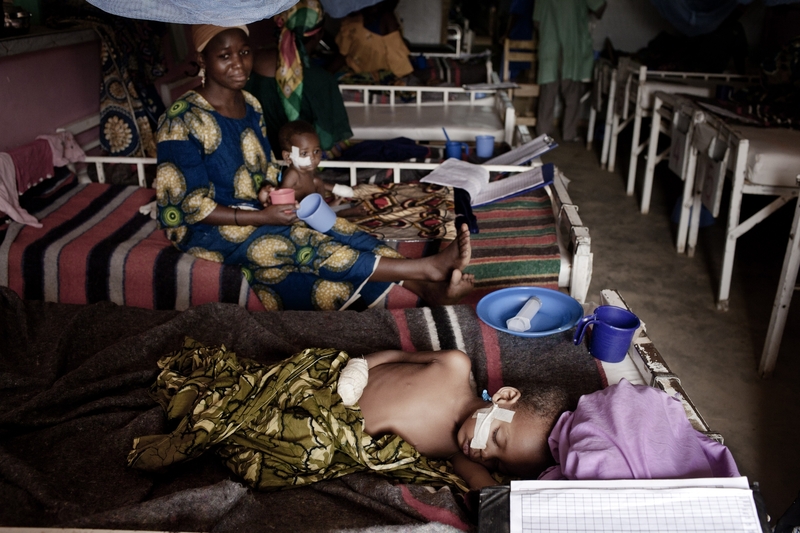 A Nigerien malnourished child at a pediatric hospital for severely malnourished children with medical complications. In Madarounfa, on the border with Nigeria, is one of the largest CRENIs (pediatric hospital for severely malnourished children with medical complications). Up to May there has been a 70% increase in the number of children being admitted compared to last year and an increase in deaths by 41%. 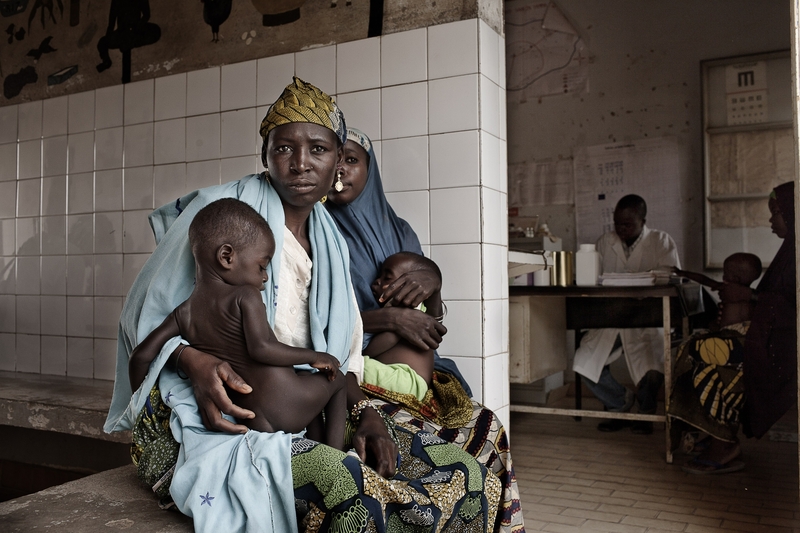 Nigerien women with their malnourished children in a pediatric hospital for severely malnourished children with medical complications. 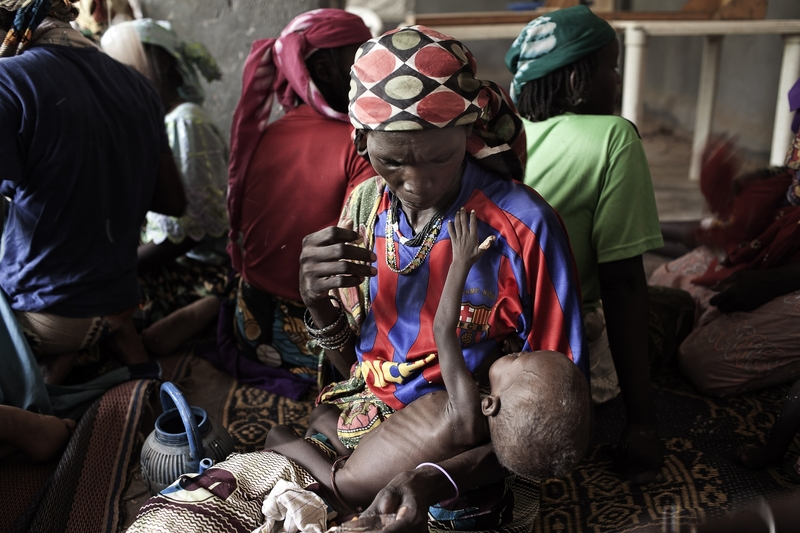 The severe food crisis, affecting this poor West African nation of Niger has progressively worsened with the country seeing a substantial increase in the number of malnourished children. One of the largest CRENIs reported a 41% increase in children dying from malnutrition. There are about 1.6 million children who are severely or moderately malnourished. Another 1 million are at risk of malnutrition. 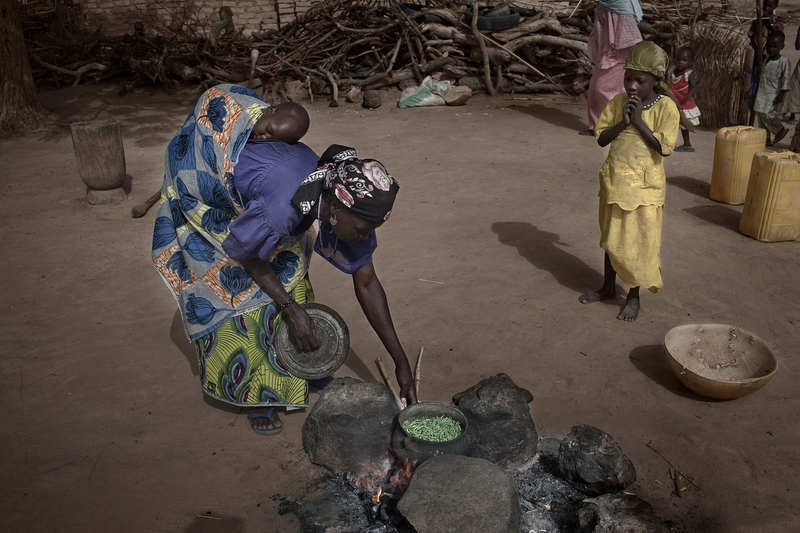 Relatives of Amina Chaibou cook the leaves from the Aguwa tree. The village of Gazoura in Zinder, 1000 km east of the capital, Niamey, is so hard hit by the food crisis affecting the country that people have resorted to eating leaves. Aicha Manzo, her neighbor Amina Chaibou and their children pick leaves each morning from the Aguwa tree. The leaves are bitter and contain toxins. The milk from the stem causes blindness upon eye contact. All the animals stay clear of this tree but 70 families in this village have no choice. They boil it four times to reduce the bitterness and toxins and eat it either on its own or with millet if any is available. There are about 1.6 million children who are severely or moderately malnourished. Another 1 million are at risk of malnutrition.